Every year, male members of the deer family — and females too, in the case of reindeer — perform a feat no other adult mammal can do. 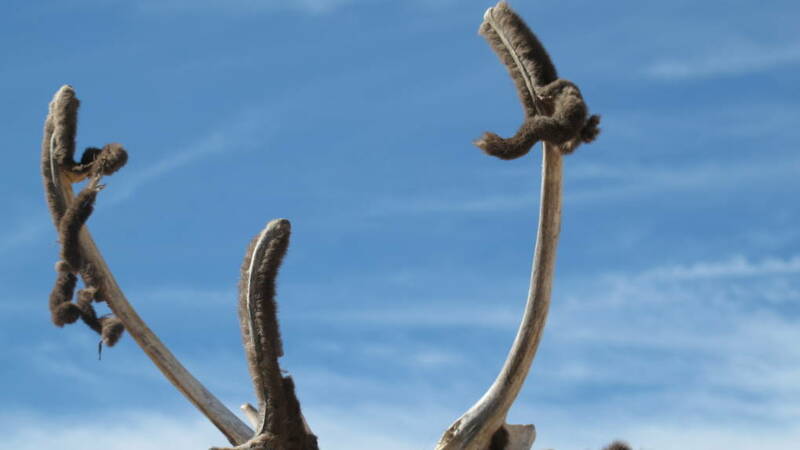 In about three months they grow an entirely new set of antlers, their iconic crown of bones. The nerves involved in this regeneration grow back at the same rate as the antlers. Their speed and ability to grow on their own make these nerves of great interest to scientists, who are investigating their ability to return mobility to damaged human limbs. Male deer, elk, reindeer, and all other members of the cervid family use their antlers to fend off competitors and woo females, then shed them once mating season is over. New antlers start growing right away, sprouting from two knobs on the deer’s forehead called pedicles, and growing as heavy as 60 pounds in the case of moose. A fuzzy layer of skin and fur called velvet carries blood rich in calcium and phosphorous to build up the bone that makes up the antlers. 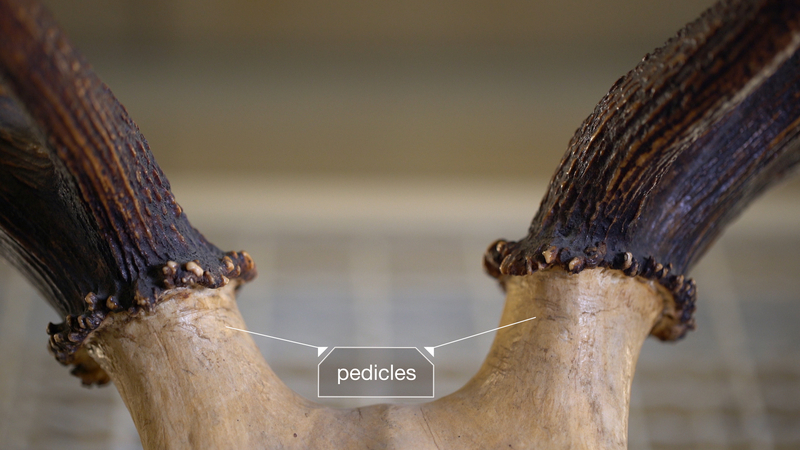 Antlers start out as special cells in the pedicles that grow into cartilage and finally bone. While they’re growing, the antlers are soft and vulnerable. Deer know to keep them out of harm’s way. That’s because nerves in the velvet give them sensation in their developing antlers and prevent them from banging or scratching them before they’ve branched out and hardened. 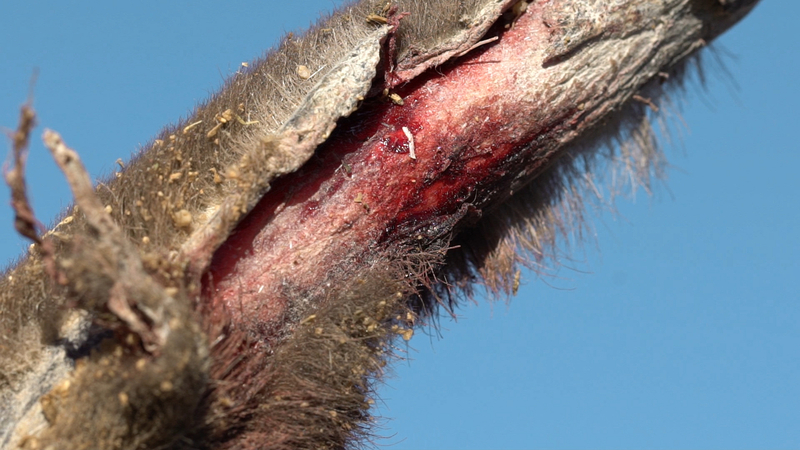 When the bone is completely sturdy after about three months, blood flow stops and the velvet cracks. The process makes the males itchy, so they scratch their antlers on leaves and branches and the velvet peels off in bloody sheets. Once the antlers are fully developed, they’re dead bones devoid of any sensation, which makes them pretty useful weapons — ones that can take a pummeling without hurting their owner. (By comparison, our bones always have nerves in them, which is why we feel pain if we break one). Male reindeer, elk, and all other cervids use their antlers to fight or keep other males away, or as a lure to attract females. Tule elk on the Northern California coast, for example, use their antlers to tear up bushes, in an effort to keep competitors away from a group of females called a harem, which they try to mate with exclusively. “It’s a sign of dominance behavior,” said wildlife ecologist David Press of Point Reyes National Seashore, in West Marin County, where some 500 tule elk — once on the brink of extinction – now live. 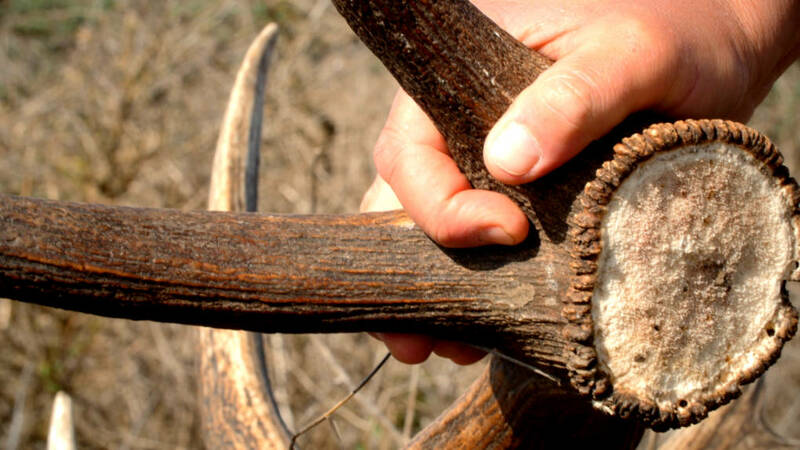 The part of the nerve that grows in the deer velvet while the antlers are developing is especially interesting to scientists. These long nerve sections are called axons, and they can grow to be more than three feet long. The axons in developing antlers are unique because they regrow year after year and they do so very fast. “Usually, in humans and most other animals, the formation of new nerves doesn’t happen. It happens some, but not to that extent,” said Pita-Thomas. This makes it difficult for people whose limbs are crushed in an accident, or severed and reattached, to fully recover their use. If doctors could get axons to grow consistently and quickly in humans who have suffered nerve damage to their limbs, this would help them recover mobility. Nieto-Díaz and Pita-Thomas believe that by figuring out what makes axons grow in antlers, they might be able to devise new treatments, or improve on existing treatments. “Ideally, we’d like to identify several factors that would act together to promote nerve growth,” said Nieto- Díaz. In research reported in the November edition of the journal Neuroscience, the neuroscientists identified three proteins in deer velvet that work together to help axons grow fast. To find these proteins, they cut off the tips of the developing antlers of live red deer that had been anesthetized, cultured them in the lab and collected the substances the velvet produced. Then they added these proteins to rat neurons in the lab and identified the ones that made the neurons grow faster. Finally, they tested several proteins acting together. They found that the combination that best promoted the growth of the rat neurons was a mix of a protein called nerve growth factor and two other proteins — periostin and laminin — that serve as a surface for the nerves to grow on. The rat neurons in the lab grew about four times faster than they would naturally, but thousands of times slower than axons in developing antlers, which can grow three quarters of an inch per day. “We saw a decent growth rate (in the rat neurons), but it’s not amazing,” said Nieto-Díaz. The fact that the rat neurons didn’t grow at the astounding rate of antler nerves leads him to believe there’s some sort of mechanical force at work stretching the axons in antler velvet, but he and his colleagues haven’t tested this out. The next step in the research is to try adding the three proteins to live rats, said Pita-Thomas, who is looking for funding to carry out this new experiment. He also would like to compare the success of the three proteins to existing treatments. Currently, when the nerves in a patient’s arm or leg are damaged, doctors can transplant nerves from another part of the patient’s body to the damaged area. This procedure is risky because extracting nerves can cause damage. In another treatment, a scaffold made out of collagen is sown between the two parts of a sectioned nerve, and nerves are allowed to grow through it. But nerves grow slowly. A treatment developed from fast-growing antler velvet nerves could help with this, said Pita-Thomas. Helping patients with a spinal cord injury, caused for example by a traffic accident, would be much more difficult than helping patients with limb damage, said Nieto-Diaz, because the spinal cord secretes substances that impede nerve regrowth. Developing a treatment based on antler velvet nerves would require first inhibiting these substances. The need for spinal cord injury treatments is pressing, though: a study from the Reeve Foundation estimates that in the U.S. more than 1.2 million people are living with paralysis from spinal cord injuries, and there’s no cure. As December comes around and the tule elk in Northern California lose their antlers, a new pair begins to grow right away. In that quick turnaround could lie the key to treatments for thousands of patients with limited mobility.